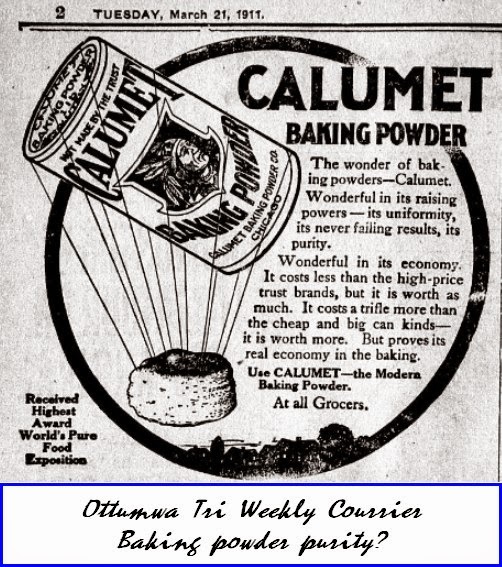 HESCH HISTORY: Baking Powder? Really?? 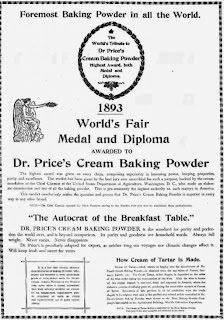 In the newspapers we're perusing from the 1880-1920 period or so, we've noticed large, even full page ads for baking powder, of all things. But why? "Baking Powder is a leavener that consists of a combination of baking soda, cream of tartar, and a moisture absorber (like cornstarch)." This is not rocket science; it was cheap, effective and a great yeast alternative. They didn't have to convince anybody to use it, and a can lasts for years. So, how come they bothered to place large newspaper ads for something so ubiquitous? 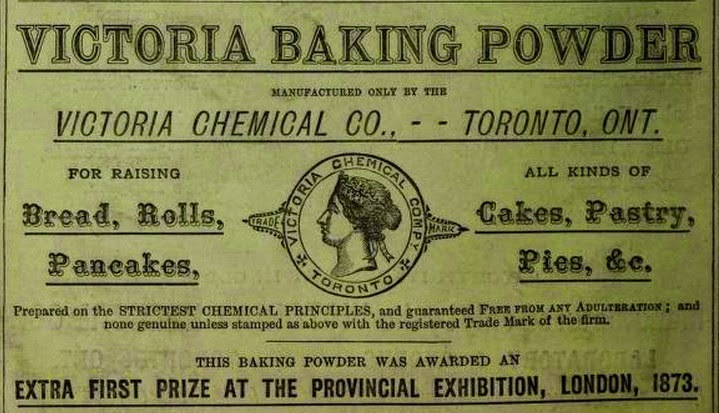 According to a website called "History of Baking Powder", it was invented by a British chemist whose wife was allergic to eggs and yeast. But that was 1843, fifty years before these ads. If you have time, click one of them to enlarge, and read the hyperbole. Stay with me here, it gets even more exciting. About 1866, "it was discovered that alum and soda made a stronger leaven, and cheaper. Worse still, alum was plentiful. Anybody could go into its manufacture, and many did. The Royal [Baking Powder Company], to control the cream of tartar industry, had contracted to take from European countries immense quantities of argol, the wine-lees from which cream of tartar is made. They had to go on making the more expensive baking-powder or break a contract”. 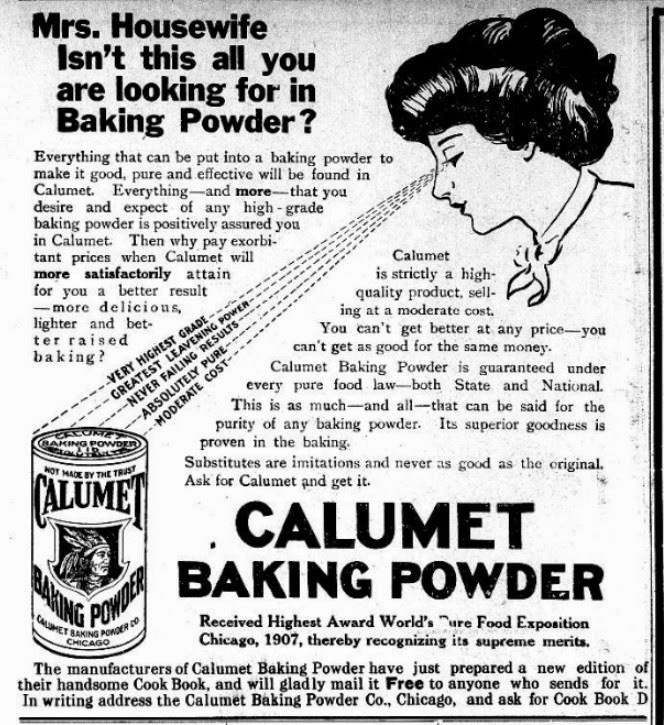 William M. Wright (1851-1931) and chemist George Campbell Rew (1869-1924) developed a double-acting baking powder whose leavening action began in the dough and repeated in the oven. 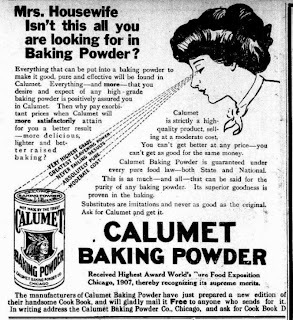 They marketed the product under the name Calumet Baking Powder. Wright was the master of Calumet Farm, the single most successful racing stable in American history with six Kentucky Derby winners, first near Chicago and later at Lexington, KY. Wright was also the cousin of Wilbur and Orville Wright. 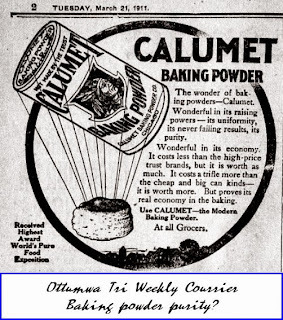 George Rew was know as the "Calumet Baking Powder King.."
See the bit about an award at the World's Pure Food Exposition in the Calumet ads? They were from 1907 and 1911, right after Upton Sinclair published The Jungle, a book about filthy meat packing practices in Chicago*. Suddenly, the whole country was concerned about food purity, and that pure food expo was held in....Chicago, in 1907. Talk about damage control. 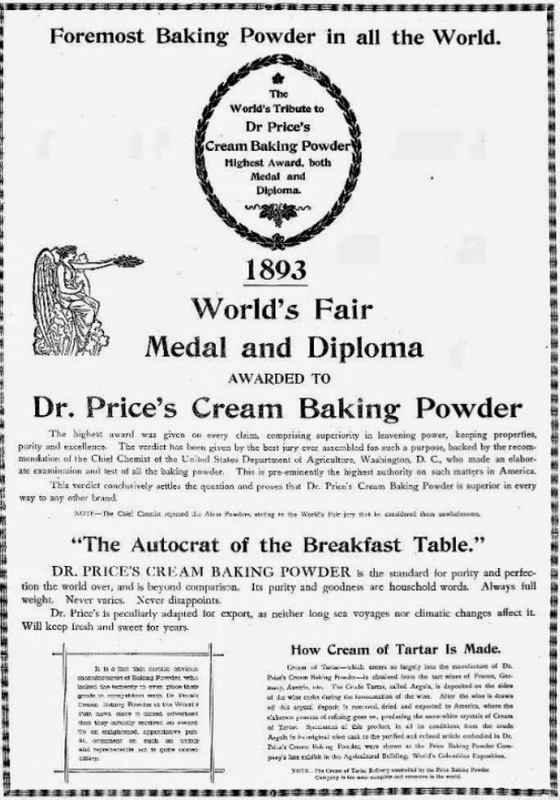 So, the success of baking powder had to do with cornering the market, controlling supply, scare tactics (see article, right), politics, financiers, and making the most of accidental public concern....over baking powder. *Why didn't the meat-packing controversy bother our families that much? Because they raised, butchered and processed their own meat, at home. See? Where else would you find such in-depth reporting and analysis, huh?